Numidium (or Anumidium), also known as the Brass God, the Prime Gestalt,[UOL 1] the Brass Tower, Walk-Brass,[UOL 2] and Big Walker,[UOL 1] was a gigantic golem of Dwemer origin. Numidium was constructed by Tonal Architect Lord Kagrenac to be a new god, powered by the Heart of Lorkhan, to retake Resdayn from the Chimer and make the Dwemer race immortal. The Dwemer disappeared from Tamriel before Numidium could be activated, though their disappearance is possibly directly related to this endeavor. Around the time of the Alessian Slave Rebellion, the Ayleid arch-mage Anumaril created the Staff of Towers, a powerful time-bending artifact composed of eight segments, each corresponding to one of the metaphysical Towers of Nirn. One of these fragments, a masterfully-crafted length of metal affixed to a hunk of polished brass, corresponded to Walk-Brass, despite the fact that the Tower did not yet exist. It is unknown how Anumaril knew of its future construction. At some point during the early First Era, the Heart of Lorkhan was discovered beneath Red Mountain. 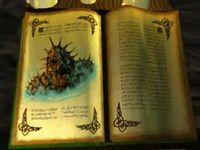 There are many differing stories about the series of events that followed, but most agree that the Dwemer High Craftlord Kagrenac created a set of tools, imbued with the power to forge mythopoeic enchantments, which made it possible for their bearers to tap the Heart's power for themselves. Kagrenac believed he could use his tools to create a new god, Anumidium, which would allow the Dwemer to transcend the Mundus. [UOL 1] Numidium was the vessel for this apotheosis. Some among the Dwemer believed that tapping the Heart of Lorkhan posed unknown dangers and unjustifiable risks, but Kagrenac and his followers refuted these ideas. It has been hypothesized that the War of the First Council may have led Kagrenac to carry out his experiments prematurely, and that the sudden disappearance of the Dwemer during the Battle of Red Mountain was the result of one of these unknown risks. However, it is also speculated that their disappearance may have been the result of successfully granting the Dwemer eternal life, in some form. Regardless of the circumstances, the Dwemer vanished from Nirn, leaving behind their creations. Kagrenac's tools fell into the possession of the Tribunal, who used them to tap the Heart of Lorkhan and make themselves into living gods. By the end of the Second Era, the Tribunal had possession of Numidium, while Tiber Septim had conquered most of Tamriel and was turning his attention to Morrowind. However, in 2E 882 Dagoth Ur had returned and cut off the Tribunal's access to the Heart of Lorkhan, preventing them from restoring themselves with Kagrenac's tools. Rather than fight in their weakened states, the Tribunes signed an Armistice with the Empire; as part of the treaty, the Empire received Numidium. Tiber Septim tasked Imperial Battlemage Zurin Arctus with Numidium's repair. There are rumors that the Emperor had the Halls of Colossus constructed in Elsweyr for this purpose, and that the area is still uninhabitable as a result. [UOL 1] On the Emperor's orders, Arctus created the Totem of Tiber Septim, an artifact which allowed a bearer of royal lineage to control Numidium. Since Numidium would not function without the Heart of Lorkhan, he devised a replacement based on his research—a huge soul gem called the Mantella. The gem required the life force, or "heart" of a powerful being, so Arctus used his own (though it is also claimed he used the soul of Ysmir Wulfharth, an undead being who may have been a mortal avatar of Lorkhan). In 2E 896, Numidium was activated near the city of Rimmen in Elsweyr and proved very effective in bringing down the mighty Aldmeri Dominion of the Summerset Isles, thus completing Tiber Septim's conquest of Tamriel. The official story says that after defeating all his enemies, Tiber Septim began using Numidium to destroy the neutral royal families of Tamriel so that he could enthrone persons he knew to be loyal. Zurin Arctus disagreed with these actions, and attempted to reclaim his heart from within the Mantella. In the ensuing battle, both the Battlemage and Numidium were destroyed; the heart they shared was blown into Aetherius. With the Mantella lost, Arctus couldn't truly die, and became an undead being known as the Underking. The heretical version of events claims that Zurin Arctus had perished while trapping Wulfharth's soul, and soon after the conquest of the Summerset Isles an undead wizard (the Underking) appeared and destroyed the automaton. The remains of Numidium were scattered throughout Tamriel. In the centuries that followed, the Blades were entrusted with the task of collecting the pieces of Numidium. During the reign of Uriel Septim VII, Numidium's reconstruction was nearly completed, save for the Totem of Tiber Septim and the Mantella. Around 3E 401, both were located; the Mantella's resting place in Aetherius was divined, and the Totem was rediscovered in the liac Bay region. The latter discovery nearly set off a civil war among the dozens of independent city-states in the region, beginning with the murder of King Lysandus of Daggerfall. Ultimately, an agent of the Blades, sent by the Emperor, recovered the Totem. A bidding war ensued among the major powers of the region, and somehow seven of them ended up in simultaneous possession of the Totem. The agent then traveled to the Mantellan Crux in Aetherius to recover the Mantella. 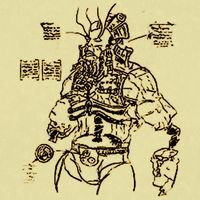 A similar golem known as Akulakhan, or the Second Numidium, was built by Dagoth Ur in the late Third Era, based on Kagrenac’s designs for Anumidium and powered by the Heart of Lorkhan. It was destroyed by the Nerevarine in 3E 427. For more information on Numidium as the Brass Tower, see the Lore article about The Towers. Numidium was featured in TES II: Daggerfall.